When I got info about Masao Suganuma’s new game after Machi Koro, I was intrigued. It looks quite different from Machi Koro, which was love at first sight (only). It has a classic style, serious and historical feeling in Edo period of Japanese history. In Sukimono, players (from 2 up to 6 players) are errand boy for their masters in Edo period, where they will travel around 8 prefectures in Japan in search of specific wares that are on demand. They do this as quickly as they can because of the competitions are fierce, the first always get the deal from the market demand. When one errand boy gains 50 Ryo (the currency used during that period), the game comes to an end. Errand boy with the most Ryo wins the game. I bet not many of you know this game (hell might be nobody know anything about this game). The game comes in a slim medium box (a good one) which contains packs of cards, tokens and tiles with a board. I must admit, Grounding made a beautiful finish game, the finishing surface of the cards, tiles and board are smooth and have a very nice feel. You’ll find the components need to be preserved to maintain the good quality for a long time, sleeved the cards or maybe sleeve the tiles? Now that’s another level. Unfortunately, if you sleeved the cards, it’s unlikely you will fit all of them back into the box. You need to find another storage solution, bigger box perhaps. So I just keep my copy un-sleeved, sleeved the box only. As I already described above, players will play role of errand boy who travels around Japan to find wares (cupperwares for tea) for their masters (which being specific of what they want). They search the wares, buy them in lower price than the market demands to gain profits. It’s quite thematic with lots of ware types, 43 types (can you imagine that number?) with the total of 186 object cards. Before the game starts, players will set all the object cards into 8 piles of draw piles (as evenly as possible) and place one prefecture card on top of each pile. Draw 5 demand cards and place them on the board based on the price. Randomize the first player and starts the game. Each round, the players will get 5 Ryo as income. And then starting from the player with the first player token and so on, will choose one prefecture to visit, take it and place it in front of him. As soon as all players already take a deck, they can check their deck and find the cards they want. They do this as fast as they can and try to be first among the players. The first one to finish this, will be the first one to sell on the market. The demand cards on the market are priced based on the types, initially. But the price can change. Each time a player sell a ware, that demand card will decrease one step in price, if it’s already on the bottom step (2 Ryo), the demand is gone, discard that demand card and ware of that kind can no longer be sold. Also if a demand card is on the top most step (15 Ryo), only a single ware can be sold, immediately discard the demand card after a player sell it. There are 186 object cards in the game, with 43 kind of wares. With that range of wares, some of them are look alike, which can be mistaken with another kind of wares, so players need to be careful to identify the illustrations, especially in race against other players. There are 3 classes of wares, low, medium and high. Low class wares have cheaper price than medium and high wares. Also each wares have different prices listed on the back side of the cards (these prices define the price players need to pay to buy it). So based on the price situation on the market, players also need to decide whether it’s lucrative or not. So aside from selecting the wares from the deck, players also need to check the price on it’s back. After all players sold their wares, if there’s still a demand card in the left most column of the market, that card is discarded, and all other cards are shifted to the left filling up blank columns, and increased price one step from the current step, unless it’s already on the topmost step (15 Ryo). The game ends when a player manages to get 50 Ryo by the end of the round, players with the most money, wins the game. Okay, this was a blind buy for me. I had the chance to get it from Japan from a friend who was kind enough to buy it for me in Sugorokuya. The game is simple with good quality components. The arts are amazing, really captures the classical style of Edo period in Japan. If you take notice on the cards’ finish, it’s not glossy or doff but has a specific texture on them, trivial, I know. The tokens’ finish is very smooth (like this very much). The game requires real time pace to search cards and also memory. Thematically, you’re scouring around Japan’s prefecture to search some wares, and you cannot help to see other wares along the way, hence it might be useful for you if you have a good memory in later occasions where you need to find those wares. Getting to be the first to sell is important, cause it can determine your chance of selling the wares before they’re removed from the market. But sometimes it’s a good idea to hold on to your wares for next round since the demands will increase in price. The game plays rather fast, around 30 minutes. Everyone can play the game, from children to adults, a good choice for family night. The game also comes in relaxed variant, where players are not race against each other while playing. So it’s not about the fastest one to complete the selection but more about how much money left in a player’s disposal. Player with the least money will have the chance to sell first. So the mindset is changed from the normal play. The first time I read the rules, my first concern is about the real time factor, which it could be problematic if in a rush, players will do the unthinkable to the cards. During the rush and excitement, there’s a possibility players bend the cards. But of course when playing the real time variant is more fun. So, have you ever, when you were a child, like to trash things, broke things up and felt that satisfaction inside? Yes I know you have. Children share the same childhood no matter what. So, in this game, you are big bad monster, like Godzilla, attacking city full of multiple-story buildings and meeples. You can blow, throw, smash things up and the baddest, meanest and with the most teeth left won the game. Sounds fun right? Fun indeed, lets see how it’s done! Terror in Meeple City is a game which previously named as Rampage, which we all know it share the same name as the well known video game arcade, Rampage, from Playstation console I guess. Because of one or other things, the game had its name changed to Terror in Meeple City. Honestly, I still like the old name better, but who cares? The game was designed by Antoine Bauza (the awesome designer of 7 Wonders, Hanabi, Takenoko and others) and Ludovic Maublanc. The game has a big box, very big square box, with cartoony funny looking monsters taking down a city full of colorful meeples. It’s heavy in weight, full of wooden meeples, thick card board tiles and a pack of cards, and don’t forget the stickers. So you and up to 3 of your friends are monsters in this game, and guess what monsters do when they are placed in a city? Yes, total destruction! You will wreak havoc in the city, demolish buildings, chow down people (Meeples) along the way to satisfy your hunger. They will scream, they will run, but boy they will not escape your grasp. The best monster wins the game by collecting points from meeples, floor or roof tiles and from objective card. Inside the big box, you can see there are lots of things. From game board pieces, wooden tokens, tiles, cards and player screens. If it’s your first time playing you need to punch all the tiles from the boards. The tiles are thick enough but somehow they have different texture, rougher linen finish than usual. Is it probably to protect the durability of the components from breathe action? Not sure. The monster pieces are big enough, and feel good to hold on to, you need to apply stickers to the pieces to add more theme to it. The cards are in good quality. I must admit that the screens are kinda flimsy, but work just fine. The interesting part is that the box has pretty good print in the inner side, it shows an illustration of the city neighborhood, that adds more beauty to it. The game is simple, and it requires dexterity to play it, interesting right? But before playing, we need to assemble a few things first, like the game board and aplying stickers to the monsters and vehicles. The game board consists of some puzzle parts that need to be connected as one. On top of the board, some rubble tiles are placed with adhesive as the base of buildings. After that the stickers need to applied to the wooden monster meeples, bodies and paws, and also vehicles. Once the board is ready laid out in the table, we can begin placing the tiles and meeples level by level to build buildings. Once it’s done, then players put his monster on its starting place, one of the four corners of the game board. Each player will get a player screen with tooth tokens, some cards (for his monster ability, one time power and objective during the game). Now, it’s time to smash the city! Okay, what can you do in this game? Not much, but surely all of ’em are fun! There are 4 kind of actions that you can do, and you can get two actions each turn. The first one is Move, well it’s basic I know, but essential. Each monster has 2 parts, its body and its paw, the body is a large wooden shaped monster which is placed on top of its paw, a round disc. So to move your monster, you must remove it’s body first and flick the paw with his finger. Careful now, if you flick the paw out of the game board, you are penalized by losing a tooth (your monster starts the game with 6 teeth, two are printed on the player screen and the rest in the form of tokens placed on the appropriate spaces on your screen). After you move, you place back your monster body to it’s paw. The second action is breathe. Yes, you can use your powerful (and bad) breath to blow things away, such as roof if you are strong enough, and meeples of course. They scream while flying as you laugh out loud. But careful, your laugh might not be that long if the game owner notice your burst out saliva all over the board, and meeples, and cards and maybe another player’s face! The most disgusting action in the game I believe. The third action is to demolish buildings with the weight of your body, slam like a pro wrestler. How it works you say? You just need to sit normally with your back straight and pick up your monster body and position your arm in a level with your shoulder and aim where you want to release the body. be careful though, if you miss your target building, you lose another tooth. Your monster paw must, touch in the sidewalk of the target building in order to take this action. If you hit the building and somehow it stands still, well can’t help it, maybe you need to cover your face in shame, puny monster! The last action is toss a vehicle. There are 4 vehicles in the game and each of them is located in separate district at the start of the game. You can toss a vehicle if you are in the same area with where the vehicle is located. So take the wooden vehicle and put it on top of your monster body, angle it anyway you like and flick the vehicle. Bam! Either you hit the target or not, no harms done, simple as that. If after any of your action there’s one or more roof / floor tile lie around (supporting nothing, without meeples or other pieces) you can take it as your trophy, place it behind your player screen and each tile will give you one point at the end of the game. And then after you already take your two actions (remember you can take one action twice in your turn), time to eat. Yes, eat meeples! Crazy yes, but of course you are a monster, so behave like one. Your monster initially can eat 6 piece of meeples (this is shown by the number of the monster’s teeth. But it is possible during the game, your monster lose some of it’s teeth down to minimal 2 teeth (printed on the screen, to show that your monster at least will have 2 teeth, no less). So to eat, check meeples that are on the street (not on the roof / floor tiles) and not supporting anything located in the same area of your monster, your monster can eat these meeples. If there are more meeples than your eating limit (number of teeth) then eat as many as you can, which you can choose which color you want to eat. Wait, color? Is this a racist game? Of course not, fortunately this game is not like Puerto Rico (just kidding) and these different color meeples shows different professions of the meeples. There are Military (green), tourist (blue), elderly (grey), Hero (red), Cheerleader (Yellow) and Businessmen (black). So what’s up with different professions? Well in the end game, if you collect a set of different meeples, you gain points. And also some objective cards require you to have specific meeples to get more points. Smash all things in the way! So, I already explained to you about several ways for your monster to lose a tooth (move out of the board and miss your demolish target), but there are more of course. What happen if your monster got knocked down when it’s not your turn? Correct, you lose a tooth. But your tooth is not place back into the box, but the player who knock your monster get the tooth and place it behind his player screen, as a single opponent tooth worth 2 points at the end of the game. So what if you only have 2 teeth left and you have to lose another? Well, you cannot take the printed tooth right? And we cannot let you get away with it easily in this brutal game of monster and madness. If you have to lose another tooth and only have the printed ones, you return 2 meeples to the box or give 2 meeples to your opponent who knocked you down. Harsh indeed. But luckily you can chow down 2 meeples. 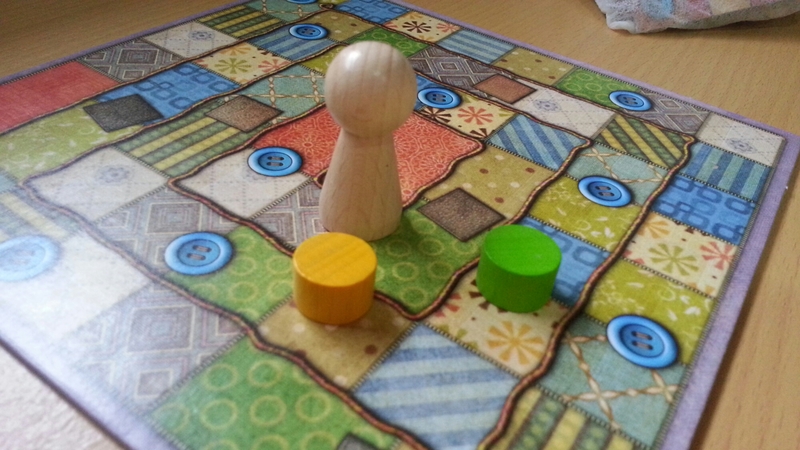 Sometimes meeples will be knocked out of the board and when this happened, the meeples are placed on the runaway board. What is runaway board you say? I haven’t mentioned yet, but here it is… Before the game start you and your monster friends will have to decide what side of the runaway board you want to use in the game. One side of the runaway board shows tracks of meeple slots based on colors, other based on numbers. And both of them have some kind of penalty to it. So whoever cause one of the tracks filled with meeples, he is penalized. One runaway board also trigger end of the game. But also if the last roof / floor tile is taken, players finish the round and count for points. Now let’s get into the cards. There are three kind of cards, the blue, green and red cards. The blue cards are objectives to give you more points, and green cards are powers that can be used during the game (you will get one and place it face up in front of you). Unlike the other colors, the red cards are placed face down. You will get one and keep it hidden (face down), this is your monster super power and no one knows about it yet, other than you of course. This is a single time ability that you can decide when to use it. Throw the bus on top of a building, it’s rooftop parking! I don’t think replay value really matter here, it’s a fun game, so the replay value lies not in the game itself, but in the gaming group. Playing this with your close friends is awesome, playing this with unknown or someone that you’ve just get to know is not so very good, playing with people you dislike, nah forget it. The fun interactions between players are the key here. Winning the game is not important, but the experience is. Of course I consider this as a light game with a huge giant box, in fact this looks like a party game for four. But this one is my most expensive party game. The box is big, pretty heavy and lots of tiles and meeples. You can consider the setup time a bit long, for a party game. But for me personally, setting up this monster is a fun experience, easy to do, just there are too many things. The game experience is very rewarding and its suitable for any ages, male of females, family and friends. One note, though this game looks simple, it requires dexterity and experience about the nature of the components, how things work and etc. So first play and the rest could be somewhat different. Flicking a disc to move is not as simple as it seems, okay, flicking part is super easy, but targeting it to the place you want it to be, that’s entirely different level. So experienced players might be better than new players. Game play aside, this game requires big table, but square, since players need to move around from their seats to get a better angle taking actions. I guess some people used lazy Susan for the table, nice solution to keep players stay at their seats. But even lazy Susan has it’s downside, you need to be very careful to spin the table or else the pieces will fall or moved. Because of it’s nature, it’s strongly recommended that players being careful when moving, not making sudden moves or maybe carefully placing their hands on the table, because if you in whatsoever change the board situation accidentally, the penalty is, of course, lose one of your teeth. Quilt can be fun, seriously! Have you ever make a quilt? Not everyone knows about quilts and how to make them. Based from Wikipedia, Quilt is a multi-layered textile, traditionally composed of three layers of fiber: a woven cloth top, a layer of batting or wadding, and a woven back, combined using the technique of quilting, stitches which hold the three layers together. Historically quilts were frequently used as bed covers; this use persists today, but quilts also frequently are non-utilitarian works of art. Quilts are distinguished from other types of blanket because they are pieced together from several layers of cloth by stitches or ties. Where a single piece of fabric is used for the top, (a “whole cloth quilt”), the key decorative element is likely to be the pattern of stitching, but where the top is “pieced” from a patchwork of smaller fabric pieces, the pattern and color of the pieces will be important. So yes, not everyone knows about Quilting and not everyone give a damn. For some this is a work of art, for others, it’s a boring and requires some sets of skill to do it, and yes it relates to female activity. But guess what, Uwe Rosenberg, the man behind the famous Agricola and Caverna designed a 2-player game based on this as it’s theme and it’s called Patchwork. So what players do in this game exactly? I am sure not fighting over someone else quilt. 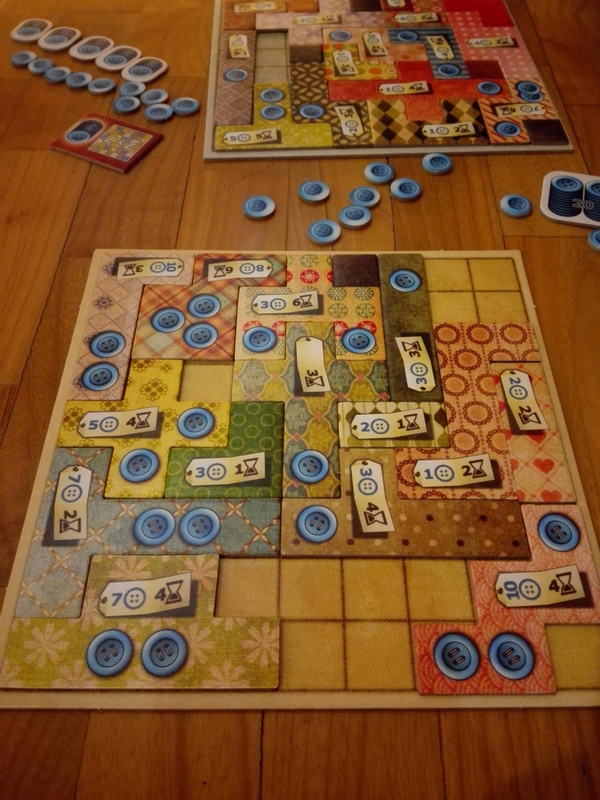 Two players will compete to get the most buttons while in the same time complete their quilt as whole as they (of course without leaving any hole or incomplete patches). The game was published in 2014 by Lookout Games and several other publishers for localization. It was launched as a part of Uwe Rosenberg’s 2-player game series just like Agricola: All Creatures Big and Small and Le Havre: The Inland Port (the game box is just as the same size with these games, 7.67 x 7.67 x 1.77 inches). It’s a small game, you can easily carry it around, but of course not in your pocket, it’s not a pocket-sized game after all. 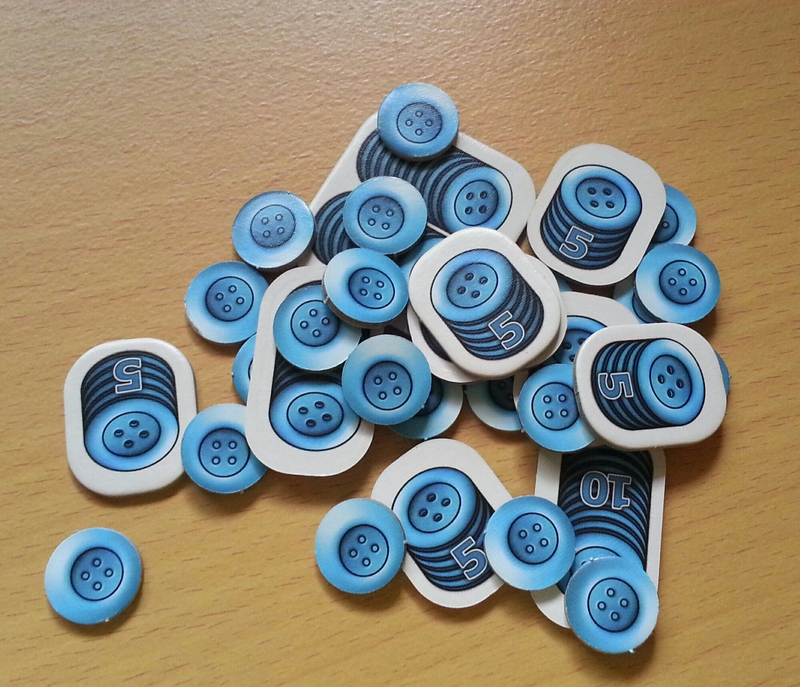 In this game, each player will have his own patch board (empty at first) to begin with and get starting buttons (buttons are the main currency in this game, just consider it as money). There is a time board that’s placed in the center and players will randomize various shaped and sized tiles to circle this board. Place a marker on the smallest size of the tile, the game starts with the marker from this place. Players will take turns to do an action until the game ends, when all players time markers already reach the last place on the track. The actions that a player can take are either take a patchwork tile or advance his time marker. When taking a tile, a player can only take one from the available 3 tiles in front of the tile marker currently on. Each tile has it’s cost, whether in buttons, time or both. To take a tile, a player will have to pay the cost (return an amount of buttons to the supply or advance his time marker along the track or both) and place the tile onto empty spaces on his board. The placement must be legal, which has to follow these requirements, the whole part of the tile must be placed onto empty space on the board, no part of the tile should be placed out of the board, and the tile cannot overlapping another tile previously placed on the board. If paying the cost of time makes a player time marker pass on a button icon on the time track, the player will receive income from his board based on the amount of button icons available on tiles he placed on his board. And also if his time marker pass on a single bonus tile, he takes that tile (as long as it’s not yet taken by other player) and must immediately place it on his board. This is the only way a players can patch a single hole on his board. Once a player time marker reaches the last place, his turn ends. If his opponent is not done yet, he wait until his opponent reach the end space. The other action is to advance his own time marker up into one space after his opponent’s marker currently at and gain buttons as many spaces as the time marker advanced. If this action lead the marker pass over button icon and/or single bonus tile, it triggers the effect(s). Also the first player who complete 7×7 grid tile on his board, he’ll receive a bonus worth 7 points at the end of the game. After all players finish their turns, they count their buttons and then subtract it with their minus points from empty spaces (-2 points for each empty space). The player with most buttons wins the game. 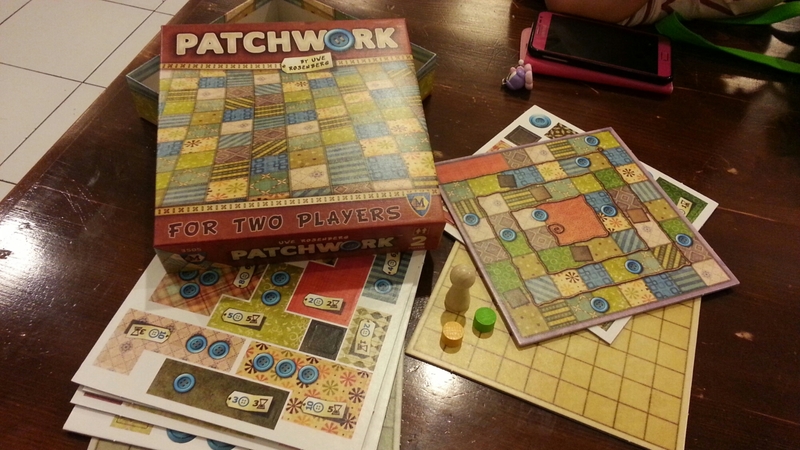 Patchwork is a simple game that only lasts for about 20-30 minutes, but unfortunately the space you need to play the game is not practically small in terms with other small games, it takes over a dining table for 2 to play this game. The rules are simple where casuals and non-gamer alike are able to play instantly. The twist is that the game has very deep calculations to do better optimized moves. So it’s hard to master but easy to play. Experienced players do better in this game compared to new players. This game requires highly calculated decisions to manage outcomes over incomes, whether the tile you’re trying to get is worth the cost or not. Larger and unusual shaped tiles are usually cheap and can cover large spaces on your board but not gives many buttons during income, while smaller and simple ones usually have expensive cost, but give more buttons. So players need to balance their outcomes with the potential income regarding the timing of the tile comes into place in the board. It’s interesting and full of important choices for some of those who find this calculated mathematics formulas as interesting puzzle. It’s purely abstract and those who doesn’t like abstract games might just not like this game, but who knows? This game can also works as a medium to teach children about simple math but still engaging in the game element. But how about the replay value, considering that experience players will get the hang of it eventually to optimize their moves, fortunately the main challenge not lies in the game, but in your opponents. So it will still engaging as long you have a challenging opponent to play with.